Over the weekend I re-found my DVDs of the The Concert For New York City . 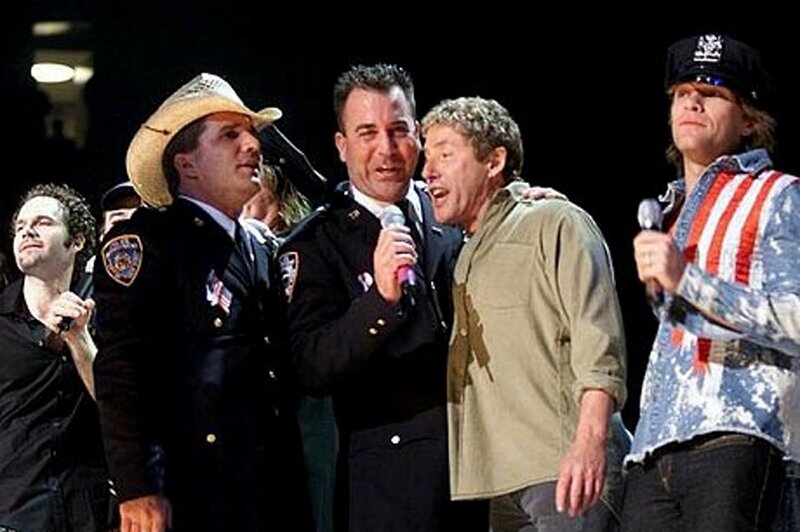 The Concert was a benefit that took place on October 20, 2001 at Madison Square Garden in New York City in response to the September 11 attacks. It was an attempt to honor the first responders from the New York Fire and Police Departments, their families, and those lost in the attacks. Performer after performer singled out individual members of the NYPD to thank them, and famous rock stars competed with each other to wear police caps that were thrown on stage. It was a very warm, very moving show, as many of the performers and all of the cops lived in New York and shared a sense of tragedy, place and survival. The cops were us, we were the cops. Then I made the mistake of hitting the news, which showed scenes from Occupy Wall Street, where those same NYPD “heroes” from 9/11 were acting like storm troopers to clear peaceful protesters out of Zuchotti Park. If anyone needed an image of how far things had changed after ten years of warring, there it is.